Developing Computer Graphics Projects with OpenGL is challenging task. It is more challenging when you see some high class projects of other. Today I am going to show you one of the finest Computer Graphics Projects made ever. The name of project is Machine Gun Recoil System. In a recoil-based machine gun, it is mainly based on the moving mechanisms inside the gun which absorb some of the recoil force. Shaft moves as trigger is made and bullet crossed the nozzle to hit the target and next bullet get recoiled to the position of previous one. This helps the army person fires the bullets in continuous fashion to stop their enemy advancement or to kill the spy. A computer graphics OpenGL Projects on the Machine Gun Recoil System is great idea to show the internal architecture of machine gun. Knowing the internal parts may helps its further development in future with more options for student keen in the area of defense. To prepare this gun to fire, we pull the breech bolt back, so it pushes in the rear spring. The trigger sear catches onto the bolt and holds it in place. The feed system runs an ammunition belt through the gun, loading a cartridge into the breech.When we pull the trigger, it releases the bolt, and the spring drives the bolt forward.The bolt pushes the cartridge from the breech into the chamber. The impact of the bolt firing pin on the cartridge ignites the primer, which explodes the propellant, which drives the bullet down the barrel. The barrel and the bolt have a locking mechanism that fastens them together on impact. The force of the moving bullet applies an opposite force on the barrel, pushing it and the bolt backward. As the bolt and barrel slide backward, they move past a metal piece that unlocks them. When the pieces separate, the barrel spring pushes the barrel forward, while the bolt keeps moving backward.The bolt is connected to an extractor, which removes the spent shell from the barrel. As the bolt recoils, the extractor slides with it, pulling the empty shell backward.The backward motion of the bolt also activates the ejection system. The ejector's job is to remove the spent shell from the extractor and drive it out of an ejection port. 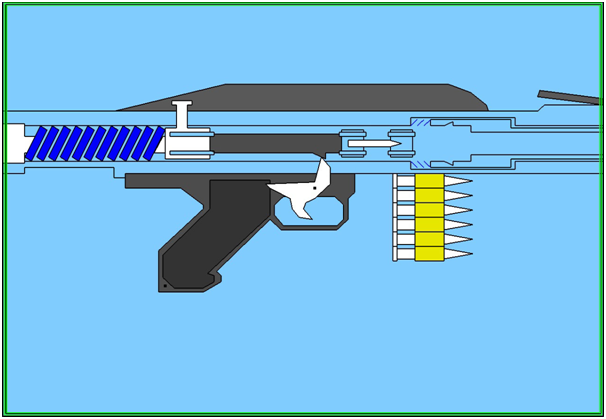 A very simple flow diagram in the form of a flowchart is shown in the figure which determines the working of Machine Gun Recoil System. Even though demo designed is enriched with many options, it is a two dimensional demo, in future it can be re-designed with 3D animation and sound effects. which platform you are using? how to download the source code???? i dont like canon bcoz of always we have keep change the aper &shutter speed but in nikon it is perfect why ???????????????? please mail me the source code for a robot with or without keyboard or mouse interactions.